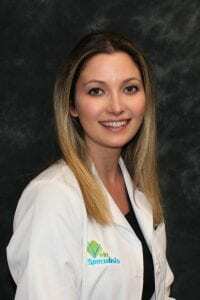 We are proud to announce that Adelene Tolisano, MSN, APRN-C, joined Vein Specialists effective February 11, 2019. She assists Dr. Magnant and his team of Advanced Providers in performing new patient, pre-operative and post-operative evaluations. Adelene grew up in Fort Myers where she attended Fort Myers Senior High School. She attended Florida Southwestern State College where she earned her Bachelors of Science in Nursing. She then went on to earn her Masters of Science in Nursing, specializing in Adult Health from South University in Savannah, Georgia. Prior to working with Dr. Magnant, Adelene worked as a cardiac nurse for a large hospital system in Fort Myers. She is a member of the American Academy of Nurse Practitioners and the American Academy of Critical Care Nurses. Adelene enjoys spending time with her husband, two small children and dog. Vein Specialists warmly welcomes Adelene to their work family. Vein Specialists is the leading outpatient vein treatment center in Fort Myers and Bonita Springs and operates the only IAC accredited Vein Center in SW Florida. Dr. Joseph Magnant, and his team of Advanced Providers offer the most comprehensive diagnosis and treatment of vein disorders using the most advanced, minimally invasive procedures available. Vein Specialists is singularly committed to excellence in vein care and is dedicated to increasing physician and public awareness of venous disease. Vein Specialists has office locations in Fort Myers at 1500 Royal Palm Square Blvd., Suite 105 and in Bonita Springs at 3359 Woods Edge Circle, Suite 102. For more information about vein disease and Vein Specialists, please visit www.WeKnowVeins.com or call 239-694-VEIN (8346). PreviousPrevious post:SPIDER VEINS – Cosmetic Concern or Tip of the Iceberg?